India 0-5 trails Australia 9-237 declared (Michael Clarke 91, Matthew Wade 62, Ravindra Jadeja 3-33) by 232 runs. The first innings of the Kangaroos was declared surprisingly by their captain, Michael Clarke, after they scored 237 runs for the loss of 9 wickets in 85 overs. India managed five runs without losing any wicket in the final three overs of the day. The second Test of the four match series commenced on Saturday, March 2, 2013, at Rajiv Gandhi International Stadium, Uppal, Hyderabad. Earlier, Michael Clarke, the captain of Australia, won the toss and felt no hesitation in batting first. 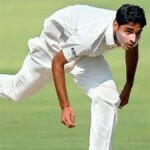 The decision bounced back instantly when they lost both their openers for 15 mere runs in 4.2 overs as the young fast bowler of India, Bhuvneshwar Kumar, struck twice. David Warner was clean bowled for six and Ed Cowan was declared leg before wicket on four runs. Phillip Hughes and Shane Watson got together, they opted to attack and hit a few boundaries almost in each over they faced. They hit 2 fours in the 10th over followed by another two by Watson in the 15th. 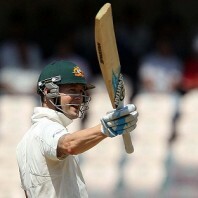 Shane Watson became the third victim of Kumar for 23 on the last ball of the 15th over as the man in form, Michael Clarke, reached the center. Hughes multiplied the miseries of the Kangaroos when he was smartly caught behind by the Indian skipper, MS Dhoni, behind the stumps off Ravichandran Ashwin for 19 runs. The visitors were reeling at 4-63 when Matthew Wade joined in with Clarke who hit the first six of the match in the 25th over. The pair kept on consolidating as the first hundred of the innings appeared on board in the 33rd over. 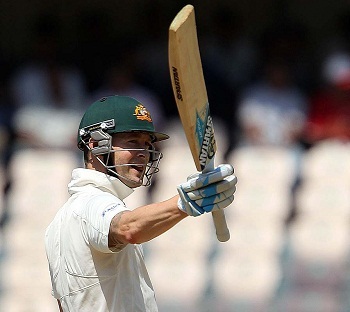 Michael Clarke was the most aggressive of the two and hit 2 fours in the 39th over as Wade was doing well at his end while picking up boundaries every now and then. Clarke got a lucky break when he was dropped at 52 by Cheteshwar Pujara at short leg off Ashwin on the first ball of the 51st over. The hundred runs partnership for the fifth wicket was recorded on the third delivery of the next over as the score touched 163. Wade completed his 3rd Test fifty on the third ball of the 55th over as Clarke hit 2 consecutive fours on the last two balls. The pair kept on consolidating as the second hundred of the innings was posted on board with a four from Wade in the 65th over. 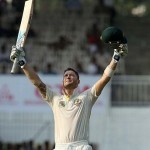 The score was enhanced to 208 when Matthew Wade was caught by Kumar off Harbhajan Singh for 62 off 144 balls with 8 fours. The home bowlers took over as the wickets started sliding at regular intervals and Michael Clarke was the ninth batsman who went back to the pavilion for 91 from 186 deliveries comprising 1 six and 9 fours. He made a bold declaration of the innings at 237 in 85 overs with one wicket in hand. Bhuvneshwar Kumar and Ravindra Jadeja were the main destructors with three wickets each, Harbhajan Singh held two whereas Ravichandran Ashwin claimed one wicket. 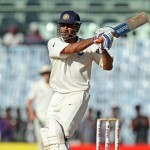 The Indian batsmen played off three overs and scored five runs with all wickets in hand at stumps on day one. India looks like being in command of the game at the moment but the first session of the play on the second day will reflect the true picture of the game.